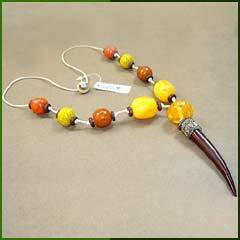 We offer a scintillating range of chemical beads necklace with white color cotton thread. These necklaces have a pendant with metal on the top. Established in 2004, we are leading manufacturer and wholesale exporter of fashion beaded jewelry, bone beaded jewelry, designer bone jewelry, chemical glow necklaces and glass beaded necklaces.